So my story on Instagram began when I was using the platform as what I thought was editing software ONLY. I would take silly photos and fun photos with intentions of using the app for editing. One photo I remember specifically was when I cut my hair very short (no longer than 3 inched or so) and I woke up with ‘lion hair’. So I took a selfie and sent it to a friend…only to find it publically displayed on Instagram with ‘likes!’ weeks later. It was such an embarrassing moment. LOL. Needless to say I’ve come very far with my Instagramming capabilities. So far in fact that I would say I’m actually more confident with using Instagram than Facebook! I definitely check it more often. For Part 2 of my social media series (check out Catherine’s Part 1 on Facebook here), I’m going to be blogging ways to Ignite your Instagram! 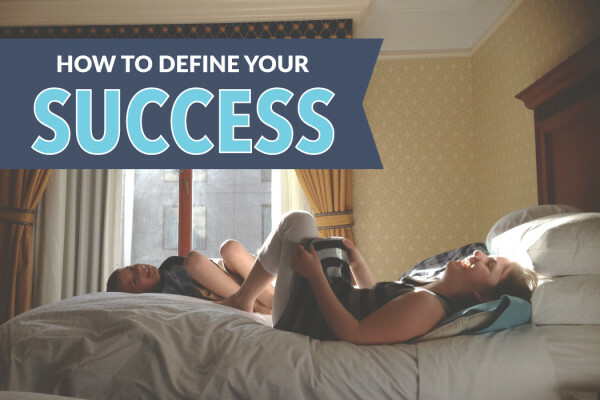 Aside from using rad images there are a few other things I have found helpful! When creating your profile, make sure to have a defining profile photo. This should be something that will catch people’s attention in the feed or when they open their comments and likes. Be sure to include your website or blog url. Often, I’ll add into the caption that there is a ‘link in profile’ so those seeing an image who want to see more can visit my website. By listing where you are located, it gives future potential clients the opportunity to inquire. I can remember when searching for my own wedding photographer, location was very important to me. I would breeze over anyone who didn’t have their city or area listed. Something fun or personal in the description will help page visitors decide if they want to follow you or not! The more you can attract followers like yourself, the better. 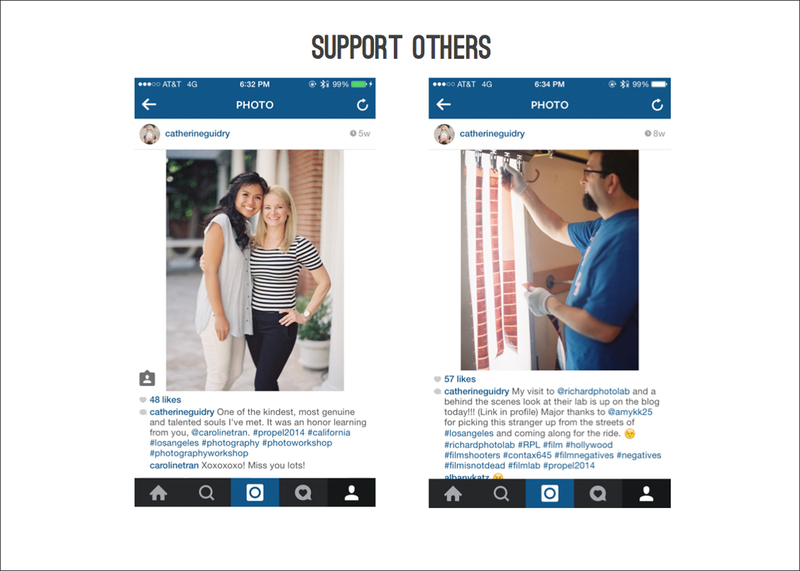 Just like I use Facebook as a way to get followers to visit my website, I do the same with Instagram! When I post a teaser image from a wedding, I always include a note that more images can be found on the blog. I’ll add the words, link in profile, so that viewers are encouraged to visit my profile and click on the link. Something new I have been seeing a lot of as well is rather than including your primary home page link in your description, if you have a specific blog post you are announcing, update your profile that day to link to that specific individual post. 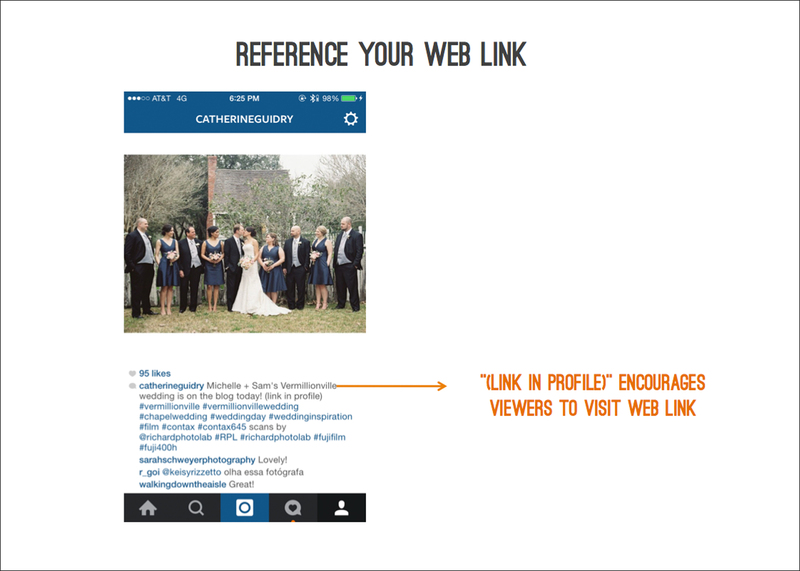 In this case, caption with ‘direct link in profile’. This has really encouraged me to click on other people’s posts in the past. This is a constant balance for me in social media. I like for my profile to feel personal and allow me to share and record moments that are special but I also want the feed to feel beautiful and professional. I have found the best way for me to mix personal into the business feed is to simply make sure that I’m being selective with the images that I am posting. I believe your feed is only as strong as your weakest image. If I am deciding whether or not to follow a person, I’m definitely looking at the quality of their imagery. 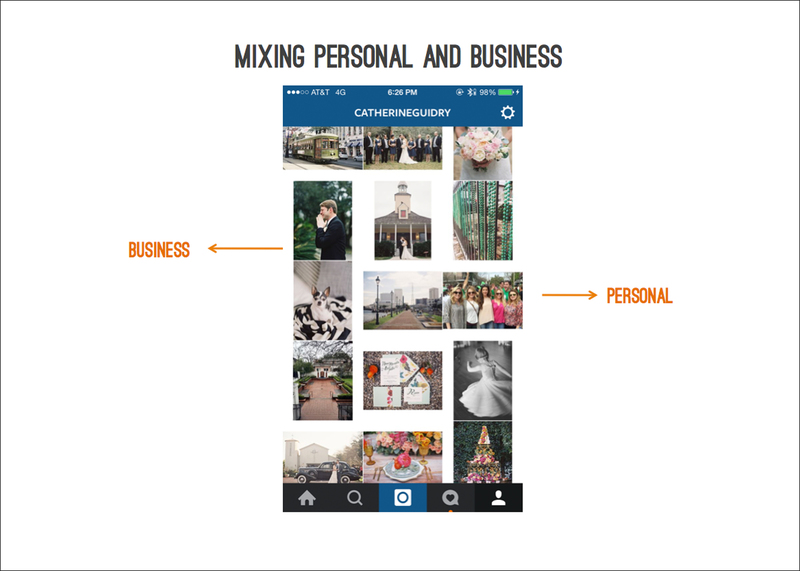 I think adding personal text into business image captions also gives a feed a personal feel and allows your followers to get to know you and your brand better. This word has become so popular over the last few years. The power of a hashtag is truly incredible on Instagram, not only for growing a following but for finding others to follow. 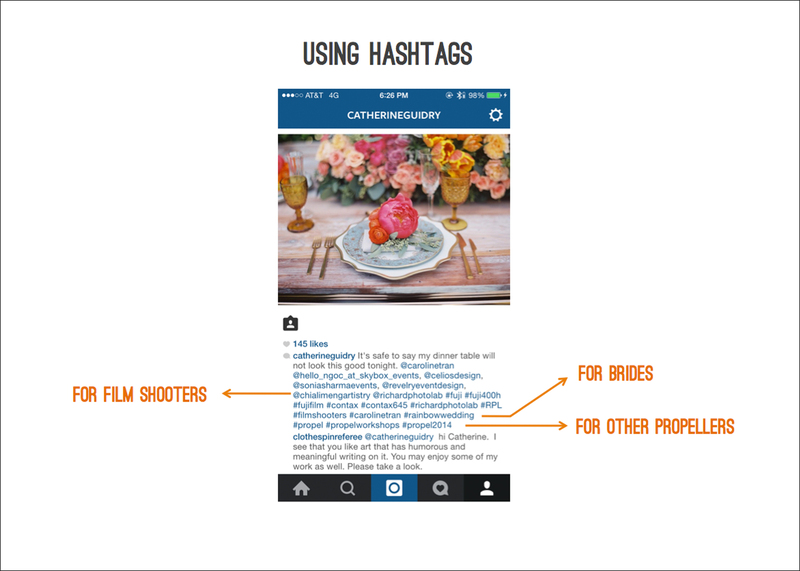 For now, we will focus on how you can grow your following through hashtags. Initially, when trying to add hashtags to a photo, I’d put something fun or silly, for example #sobeautifulcantdeal but now I put words that I think others will search for! For example, this was a photo I took at a recent photography workshop. 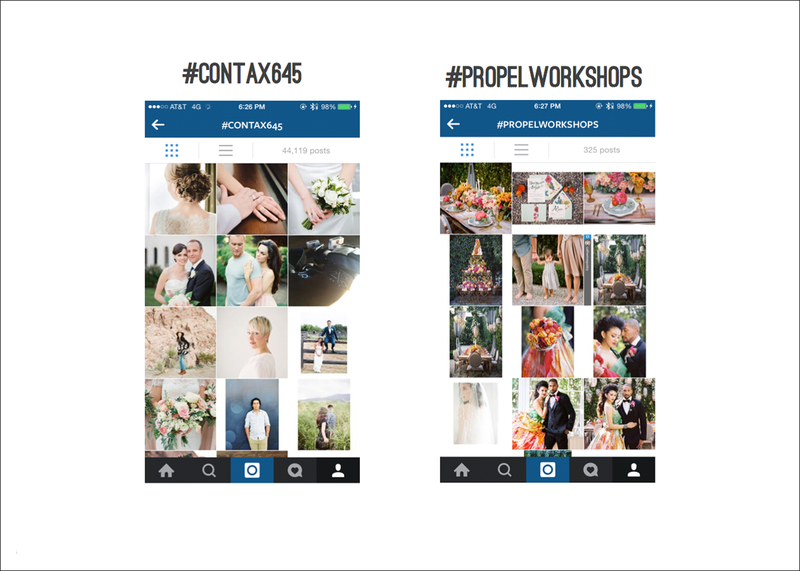 So the hashtags I chose were either geared toward other film shooters #contax645, #fujifilm, #richardsphotolab, towards other brides, #rainbowwedding or toward future workshop attendees, #propel, #carolinetran, #futurepropellers. By searching a hashtag, this brings up ALL the images that have been captioned with that same hashtag. For example, if I photograph with my Contax 645 and then write in the caption #contax645, when someone searches #contax645, my photo will come up alonside anyone else who has captioned their photo with this same hashtag. Choosing WHAT to write in the hashtag is key because if someone happend to search #contax645camera, them my image would not come up. One of the coolest connections I’ve had on Instagram so far was the result of tagging a vendor. I had photographed a client in a Tara Keely gown (who also just happens to be a photographer). When I tagged Tara Keely, their marketing director not only visited my bride’s feed but mine as well and asked us to collaborate on a shoot together! It was such a unique connection to have Instagram lead them to us. I’m still so grateful to have had this opportunity for collaboration. 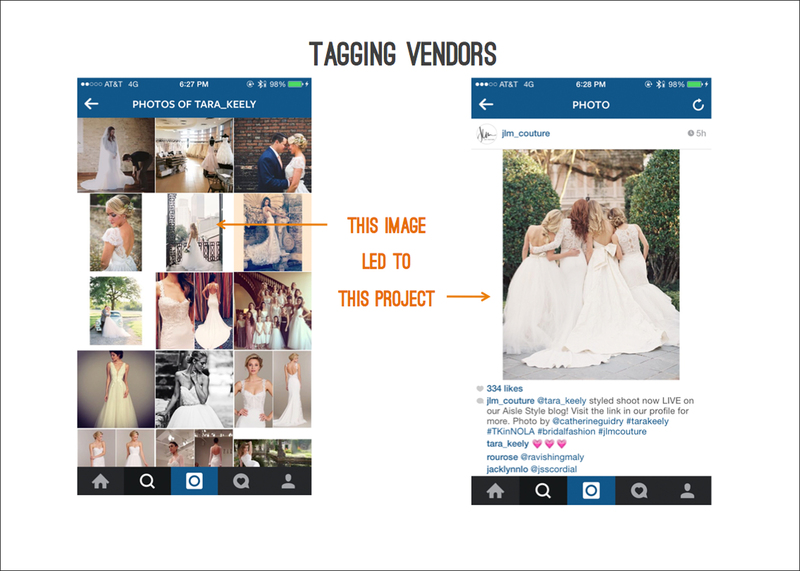 Tagging other vendors allows your images to pop up in their tagged photos and gives them the incentive to notice you! The photography and wedding industries feel smaller and smaller each yea. And each year I am continuously blown away by the talent that surrounds me. I absolutely LOVE to share with others, companies that I believe in. Below are two such examples. 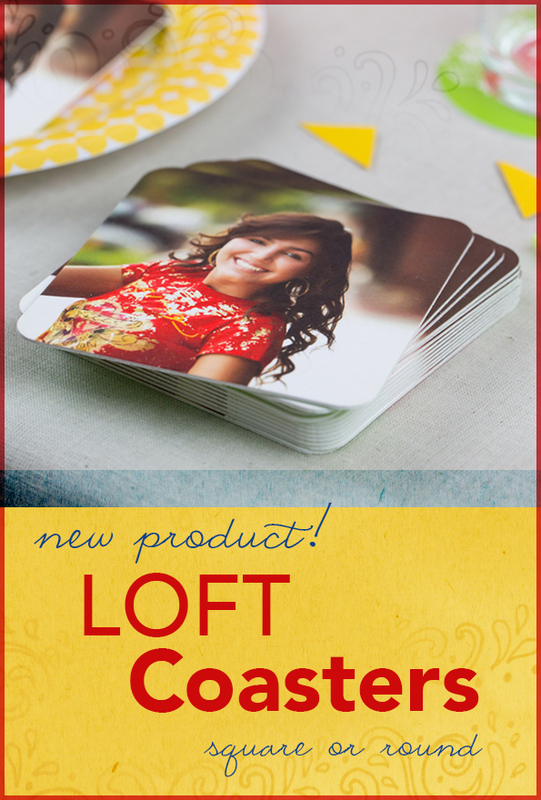 Caroline Tran is a photographer I have admired for years and after attending her Propel Workshop, I had to share! My film lab has also been very instrumental to the growth of my business. While on a visit to their lab in Hollywood, I photographed the visit and shared the images! Others have made these small, thoughtful gestures towards me. I want to pass on the love. I enjoy seeing an industry that continues to grow together. Once upon a time when I wanted to research a travel spot, location, idea or ANYTHING for that matter, I would open Google. Now, I open Instagram. It really is the truest form of research. It’s unfiltered and it’s real life photographs. 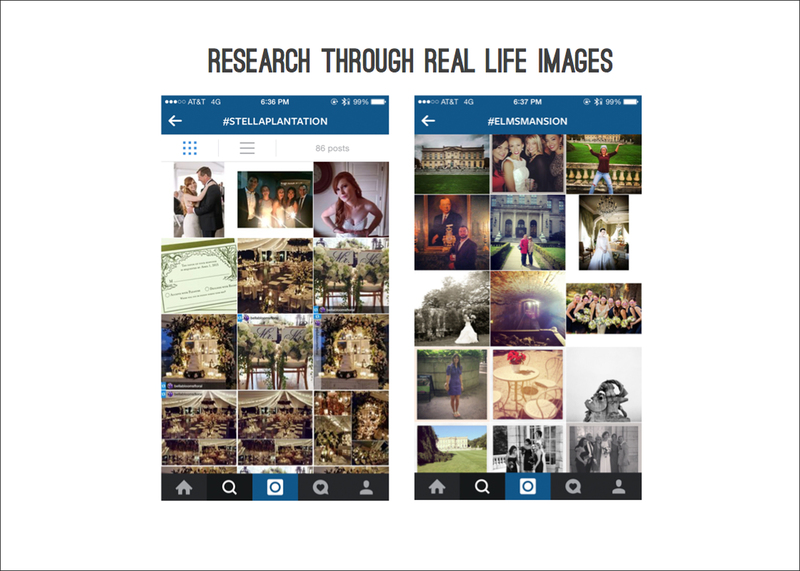 By searching a hashtag, this brings up ALL images that have been captioned with that same hashtag. See the two examples below. For both of these wedding venues, these are real life images that others have posted! What a great way to really get a feel for a specific location. The ability for Instagram to connect others from ALL over the world is insane. Truly (but in a good way of course!). 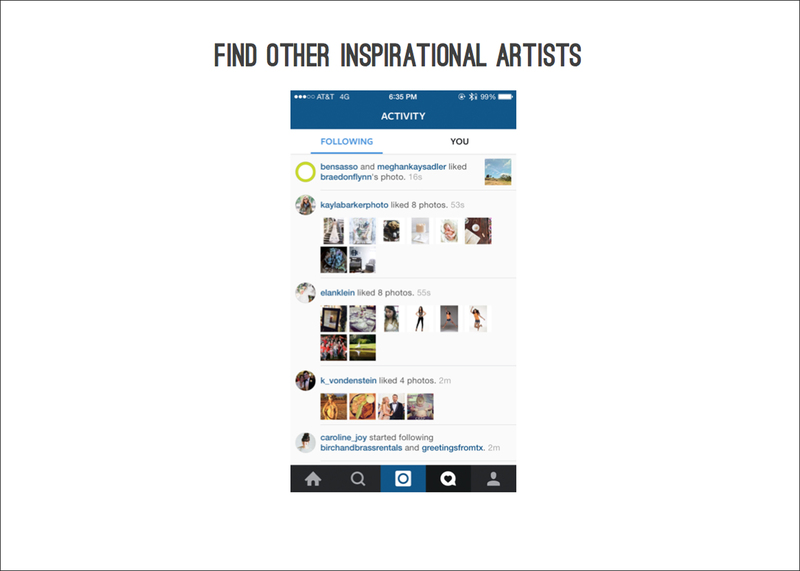 I’ve found artists from all over that have inspired me simply through searching tagged photos, tagged artists, and hashtags. In the image below, you will see the Activity section where when selected, displays photos that people I follow are liking. This is the most wonderful aspect of Instagram. I love that this platform has made art so easily accessible and shared. It’s a beautiful thing. 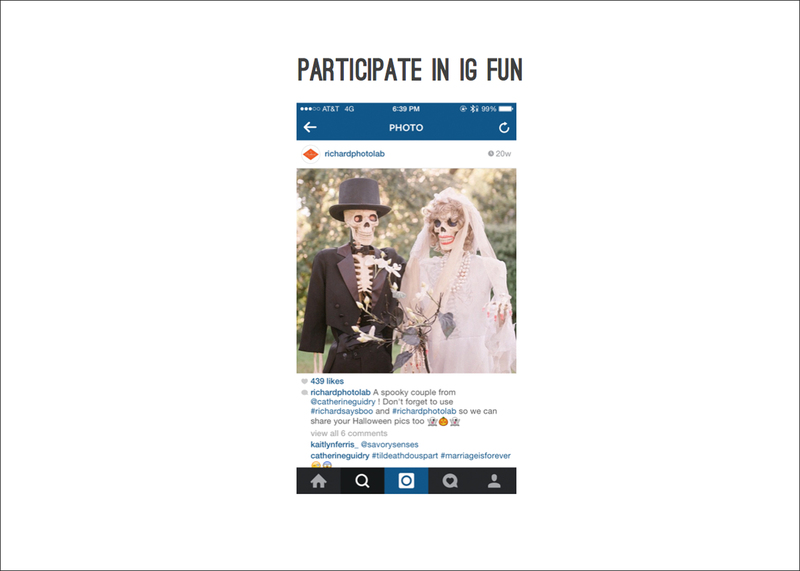 There’s always giveaways, competitions, and sharing happening on Instagram. I remember for this particular image below, my film lab was encouraging its followers to use the hashtag #richardsaysboo for their halloween images. When I posted this photo, I used the hashtag. Later that day, they choose my image to display in their feed! What a HUGE honor! The fact that they are supporting me as I support them is so encouraging! 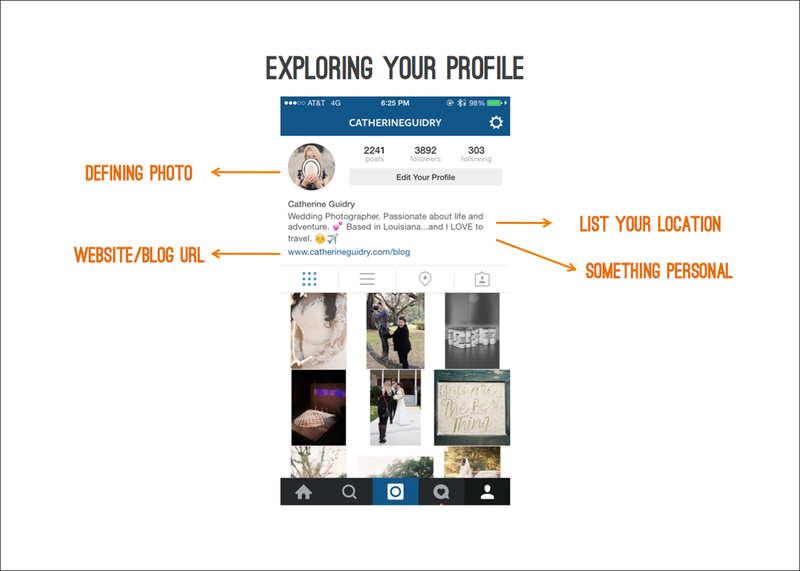 Instagram, like any form of social media can be a bit daunting at first. Of course, there is plenty of temptation to resist ‘another social media platform’ just because there are so many out there. I can honestly say that this platform brings more joy, art, and healthy competition to my life! It inspires me daily with what people are doing and achieving. That is something to be admired!